There are only five days left until Kevin leaves the Napa Valley to return to his beloved New York City – the city that never sleeps. It is a sad, sad time. He only visitsfor 2 months each summer, but those two months are full of so much laughter that when he leaves it seems like summer immediately ends and fall begins. I love when Kevin is here because we cook. We sit on the porch. We listen to show tunes…there are thousands of gallons of Sauvignon Blanc consumed. Sometimes if we are really lucky Kevin will dance a little jig to Liza Minelli. But, before I get any sappier…which could be hard…Kevin hasn’t left yet so we got to enjoy a wonderful evening with him last night. The theme was Sandra Lee…semi-homemade! It was a simple meal consisting of basic ingredients that were in the fridge and needed to be used. But, of course there was a little bit of Napa Valley spin on it! 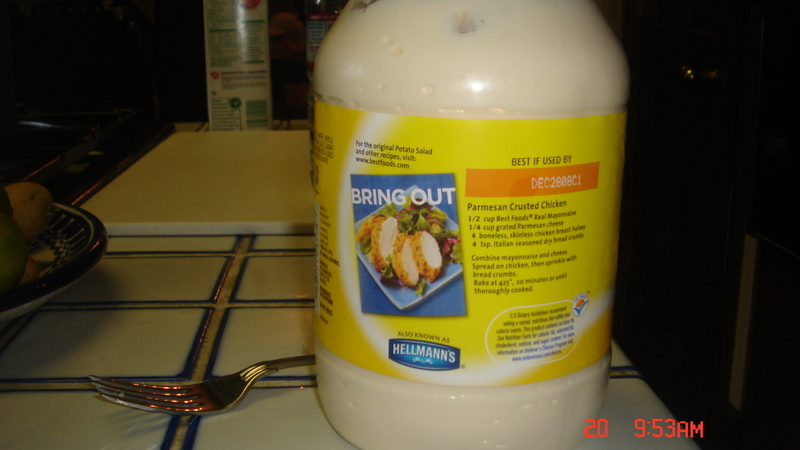 Now before I actually give the preparation of the chicken you should know one thing – I detest mayonnaise. Yes, I pretty much can’t even look at the substance. So when Kevin pulled out the mayo jar and grinned and said we were making the recipe for chicken on the back…I was a little disturbed. But, I went with it considering that is what the host had chosen for the main course. And I am glad I went out on that limb. The chicken was delicious…the mayo-parm-bread crumb mixture gave it a perfect topping that kept it succulent and juicy. Salt and Pepper the chicken. In a bowl mix together the mayo, Parmesan cheese, and bread crumbs. Sprinkle in herbs (we used Thyme and Oregano) and a dash or two of Cayenne Pepper. Spread the mayo mixture over the chicken. Bake at 425 for 20 minutes. Halfway through add the asparagus to the roasting pan. So this is a combination of two things…leftover potatoes from the night before and something from scratch. I am going to combine them so it will be a little easier if you want to try these at home. And believe me, you do! These were maybe some of the best potatoes I have ever had, and at this stage in my life, there has been a lot of potato consumption. Slice the potatoes as thinly as possible. Place 1 layer of potatoes in a buttered dish. Pour a little cream over the potatoes. Dot the potatoes with Horseradish. Salt and Pepper. Another layer of potatoes, and dot again with Horseradish. Then dot with some sour cream. Cover potatoes and cook at 350 for 45 minutes to an hour. Meanwhile while potatoes are cooking, cook the bacon and caramelize the onions. Halfway through the potatoes cooking time top the potatoes with the onions and bacon and cook the remainder of time. Seriously, make these things, they are divine!